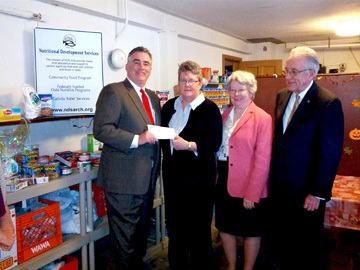 Present for the visit and check presentation by ConAgra Foods to Nutritional Development Services Nov. 13 at Divine Mercy Parish in Philadelphia are, from left: Rich DeLeo of ConAgra; Denise Hopkins, administrator of NDS’ Community Food Program; Lorraine Knight, NDS director; and Joseph Sweeney, secretary for Catholic Human Services of the Archdiocese. A major American food producer recognized the exceptional service provided by Nutritional Development Services (NDS) of the Archdiocese of Philadelphia. ConAgra Foods awarded NDS a Nourish Our Community grant of $12,500 Nov. 13. The money will help NDS buy food to stock the 35 food cupboards it supports in the Philadelphia region, according to NDS spokesperson Anne Ayella. One such cupboard is located in the rectory basement of Divine Mercy Parish in Southwest Philadelphia. The small room was jammed with packaged foods and with representatives of NDS, Catholic Human Services and archdiocesan officials on Tuesday for the award presentation by ConAgra’s Rich DeLeo. NDS is one of only 19 agencies in the country to receive ConAgra grant this year. Funds from the grant will also supplement operating funds from the Archdiocese’s Catholic Charities Appeal and food collected by schools, parishes and religious education programs. Last year, NDS food cupboards assisted 376,580 senior citizens, adults and children in the greater Philadelphia area.